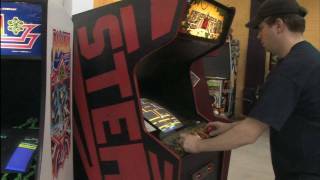 Classic Game Room reviews LOST TOMB arcade machine from Stern released in 1982. This Robotron 2084 meets Berzerk meets Gauntlet arcade game packs serious challenge as your explorer runs around collecting chests and shooting nasties with an auto-pistol that needs constant reloading. Lost Tomb is a stand up arcade machine from 1982 that has two joysticks and a whip button for your "Indiana Jones" style super whip that clears out enemies and brings down walls. Don't forget to buy new whips with a quarter! This CGR review of Lost Tomb from Stern has Lost Tomb arcade gameplay on a Lost Tomb arcade machine located at PAPA (Professional and Amateur Pinball Association) World Headquarters. Varkon review. http:www.ClassicGameRoom.com Shop CGR shirts, hats, mugs & gear! http:www.CGRstore.com Classic Game Room reviews VARKON arcade game pinball machine from Williams released in 1982. One of only 90 Varkon machines ever produced, this amazing model lives at the Professional and Amateur Pinball Association World Headquarters in Pittsburgh. Varkon is a pinball machine crammed into an upright arcade game cabinet and played in a mirror with joysticks for flipper controls. Plays like a pinball machine, tasts like a videogame. Varkon is a rarity and very cool because of it, also the art design, title and gameplay are truly unique and very detailed. It handles in a unique way because the gameplay is basically reversed and the joysticks change the characteristics of ball handling. This CGR review of Williams pinball machine Varkon has gameplay from Varkon arcade game showing Varkon game play footage in HD in this Varkon review. Filmed at Pinburgh 2011. Classic Game Room reviews GODS EATER BURST for Sony PSP from Bandai Namco, Shift and D3. God Eater Burst is the sequelUS re-release of the ultra-popular Japanese smash hit on the PSP, God Eater. Play as a Next-Gen and hack and slash monsters with a giant swort that transforms into a gun and can also physically eat Aragami. In God Eater Burst you play through an awesome storyline as a new recruit in the fight against the plague of monsters that have destroyed Earth. Gods Eater Burst is like Monster Hunter meets Phantasy Star Portable 2 and some other hack and slash adventure games. Tons of fun! This CGR review of Gods Eater Burst on PSP has gameplay from Gods Eater Burst on Sony PSP for this US release of a previously Japan-only videogame called God Eater Burst. Additional PSP download content is available. https:www.amazon.comdpB07HGKN55S TOME OF INFINITY http:www.ClassicGameRoom.com All CGR stuffhttps:www.amazon.comdp1719917345 Ultra Massive 5 https:www.amazon.comdp1719877599 Ultra Massive Genesis https:www.amazon.comdpB07GMZCQFQ Lord Karnagehttps:vimeo.comclassicgameroom CGR continues on Vimeo http:www.amazon.comvclassicgameroom CGR 2085 show on AmazonULTRA MASSIVE VIDEO GAME CONSOLE GUIDE VOLUME 1: https:www.amazon.comdp1521937176Follow CGR at: http:www.twitter.comClassicGameRoom http:www.facebook.comClassicGameRoom http:www.instagram.comClassicGameRoomClassic Game Room reviews SUPER ALESTE for Super Nintendo from Compile released in 1992!! CGR Super Aleste review has Super Aleste gameplay recorded from Super Famicom. Super Aleste is also known as Space Megaforce for Super Nintendo in this Space Megaforce YouTube review of Super Aleste YouTube review. Top 288 Best Arcade Games of all time in just 9 minutes !!! Classic Game Room reviews BATMAN ARKHAM ASYLUM for OnLive from Warner Bros., Eidos and more. This Batman videogame was released in 2009 for Xbox 360, PS3 Playstation 3 and PC and is available to stream from the OnLive service for the game system or PC laptop. Classic Game Room reviews Gottlieb's 2001 from 1971, a pinball machine from the past depicting the future in the past!! While this 70's electro mechanical pinball machine has no relation to the classic film, 2001 A Space Odyssey, the inspiration is clearly there. Girls in spandex flying through "space", colors, stars and a dude surfing on a triangle, it's Gottlieb's 2001! This pinball video review shows 2001 the pinball machine on video with gameplay from Gottlieb's 2001 at PAPA World Headquarters in Pittsburgh. Look at the backglass (2001 back glass), bumpers, flippers and drop targets. It's Gottlieb's 2001 pinball machine at the arcades! Classic Game Room reviews the TOMB RAIDER TRILOGY for Playstation 3 from Square Enix, Crystal Dynamics, Buzz Monkey and Eidos. Three massive adventure games on one disc, this collection contains Tomb Raider Legacy, Tomb Raider Anniversary and Tomb Raider Underworld. Both Tomb Raider Legend and Tomb Raider Anniversary have been remastered for HD video and include Playstation Network trophies and new avatars for use in Playstation Home. Roadblasters review. http:www.ClassicGameRoom.com Shop CGR shirts & hats! http:www.CGRstore.com Classic Game Room reviews ROADBLASTERS from Atari released in 1987, the actual Roadblasters arcade machine with the awesome steering wheel! !